Two hard-working Americans named Bob, who really love to shoot! Where do you get your bullets from? We manufacturer our own bullets using materials we source in the US. We’re a small owner operated shop that truly cares about making the best projectiles available at an affordable price. Our bullets are 100% American made. We are very proud of that fact! No, we sell only bullet projectiles for reloading your own cartridges. All orders are shipped via USPS Priority Mail packages. We offer same-day shipping on all orders placed before noon PST, Monday-Friday(excluding holidays). Orders placed after noon will go out the following business day. Orders placed after noon PST on Friday will ship out the following Monday. Where are you located? Can I come to the shop to buy bullets? Our factory is located in Carson City, NV. We don’t have a retail location store, but if you’re local to the area give us a call and we’ll try to accommodate your pick-up. Yes, prices listed on the website will always be the most current. 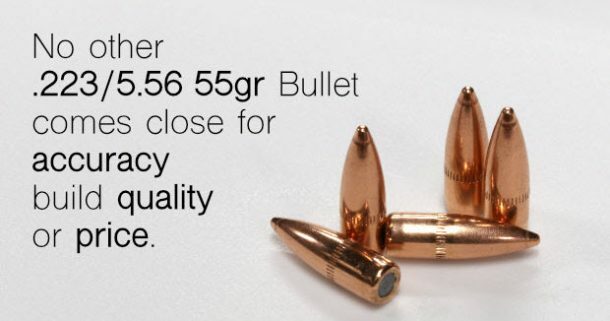 Why are your bullets so much cheaper than other places? We’re a small shop with less overhead, and that lets us offer you better pricing. How much is shipping on your 1,000-pack of .223 FMJ bullets? How much is shipping on your lead cast bullets? We can ship up to 40 lbs for around $14. You can preview actual shipping charges from the shopping cart before placing your order. What’s the hardness of your lead cast bullets? Our alloy mixture is 6% antimony for a BHN rating of about 16. Due to restrictions, we are only able to ship to destinations in the USA only. What load data should I use? We recommend researching load development with the powder manufacturer, and consult reloading manuals to find accepted load data for all of our bullets weights. How fast can I run my lead bullets? We recommend loading lead cast bullets at lower velocity to reduce lead fouling. Your powder manufacturer should have specific load data for lead bullets. Are your cast bullets lubed? Yes, all of our lead cast bullets are lubed with high-quality commercial lubricant. Do you offer other bullets not listed on your website? We do offer special wholesale quantities, but our website lists all our products. Which gun powder do you recommend? Propellant is often a personal preference. Our own shooters use several different powder companies based on their individual needs. Do you sell 5.56 NATO bullets? Yes, our bullet projectiles are used to load .223 Rem / 5.56 cartridges. What diameter are your .223 Remington / 5.56 NATO bullets? What is the G1 ballistic coefficient of your FMJBT w/Cannelure? Are you ever going to make a .30 caliber bullet? We’re always looking to bring value to shooters. Check our website for updates. We do offer discounts for orders of 25,000 pieces or more. Why don’t you have someone standing by the phone to answer questions? We are a small shop and one of the ways we keep our prices so low is by not having a receptionist to answer calls. If you leave us a message we will get back to you asap. We check our messages several times throughout the workday and get back to you as fast as possible. Rest assured we are on the shop floor making bullets for you!